This fact sheet provides information on encephalitis. It focuses on encephalitis in adults. Our fact sheets are designed as general introductions to each subject and are intended to be concise. Sources of further support and more detailed information are listed in the Useful Contacts section. Each person is affected differently by encephalitis and you should speak with your doctor or specialist for individual advice. Encephalitis is an inflammation (swelling) of the brain. The inflammation is usually caused by an infection from a virus. It can also be caused by problems with the immune system and, less commonly, bacterial or fungal infections. The inflammation can affect one area of the brain or several different areas. The infection and inflammation can range from mild to severe. Encephalitis is rare and affects approximately 4,000 people in the UK each year. Only certain viruses have the capability to affect the nerves and gain access to the central nervous system (the brain and spinal cord). They do so via the blood-brain barrier which usually filters the blood and prevents harmful particles reaching the brain. In most cases, being infected with one of these viruses will not cause encephalitis. Other viruses that less commonly cause encephalitis include the mumps virus, the Epstein-Barr virus (glandular fever), echovirus, Coxsackie virus, human immunodeficiency virus (HIV) and cytomegalovirus (CMV). Some people can experience encephalitis in the days or weeks following a viral infection (post-infectious encephalitis). Although rare, this is due to a problem with the immune system which causes it to attack the brain. Sometimes people can experience encephalitis when their immune system mistakenly attacks their brain without them previously having had a viral infection. This is called autoimmune encephalitis. Often, the cause of the problem with the immune system is unknown. Very rarely, encephalitis can be caused by bacterial or fungal infections. Several different viruses that can cause encephalitis are spread by insect bites (for example, mosquito or tick bites). These are more commonly found outside the UK. Other symptoms can include sensitivity to bright light and a lack of co-ordination (unsteadiness when walking or clumsiness with the hands). In cases of severe infection, people might lose consciousness and go into a coma. 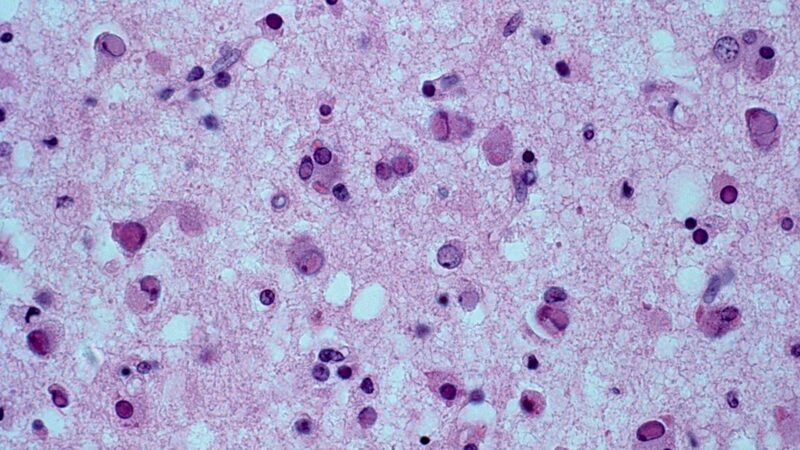 Encephalitis caused by the herpes simplex virus (herpes simplex encephalitis; HSE) affects the temporal lobes, an area of the brain responsible for memory and speech. Less commonly, HSE also affects the frontal lobes which are responsible for controlling emotions and behaviour. People with HSE might also experience weakness, especially in one side of their body. Although the herpes simplex virus is also the common cause of cold sores there is no established link between experiencing cold sores and an increased risk of developing HSE. A CT scan (computerised tomography scan) is a special type of X-ray which takes pictures of the brain from different angles. An MRI scan (magnetic resonance imaging scan) produces detailed pictures of the brain using strong magnetic fields and radio waves. Doctors will check the results of the scan for inflammation and to rule out other problems that could potentially be causing your symptoms such as stroke, subarachnoid haemorrhage, an abscess or a tumour. Sometimes, during a CT or MRI scan, a dye (contrast agent) is injected into a vein in your arm. The dye travels through your bloodstream to your brain and can help to highlight in the pictures any areas where there is inflammation (swelling). The brain and spinal cord are surrounded by a clear liquid called cerebrospinal fluid (CSF). For some people, the signs of encephalitis are indicated by abnormalities in their CSF. To take a sample of this fluid, a needle is passed between two vertebrae (spinal bones) at the lower end of the spine into the space containing the CSF. A small amount is drawn off in a syringe and sent to a laboratory where it will be checked for any abnormalities. An electroencephalogram (EEG) involves having wires attached to your head for 20 to 30 minutes during which time a recording of the electrical activity in your brain is made. The wires are connected to small pads that are gently attached to your scalp. A skin-friendly glue might be used. The test is painless and safe. You might have blood tests to check for signs of infection in the blood and as part of the process to rule out other potential causes of your symptoms. People with encephalitis need careful medical attention in quiet, calm surroundings. General medical care will include close monitoring and pain relief drugs for headaches. Fever (high temperature) will be reduced using electric fans, sponging with lukewarm water, or medication. People with severe symptoms are likely to need treatment in an intensive care unit. They might receive help with breathing (oxygen through a face mask) and help with feeding and hydration (via a drip). Acyclovir (brand name Zovirax) is an anti-viral drug used against the herpes simplex virus. It is usually given as soon as possible to people with suspected herpes simplex encephalitis (HSE). This might be before tests and investigations are completed and the diagnosis confirmed. The earlier Acyclovir is given, the lower the risk of long-term disabilities caused by HSE. Acyclovir is given by an injection into the vein. People experiencing epilepsy (seizures) as a symptom of encephalitis will be given anti-epilepsy drugs (AEDs) to control seizures. People with post-infectious or autoimmune encephalitis might be given drugs or other treatments to suppress the activity of their immune system. If you are diagnosed with bacterial encephalitis you will be given antibiotics. Anti-fungal treatments are used to treat fungal encephalitis. People might receive other drugs such as steroids (to reduce inflammation), diuretics (to reduce pressure inside the head), and sedatives (to calm people if they are agitated and to help control seizures). The inflammation of the brain can last from a few days to two or three months. After this, most people find that they make their best recovery from their symptoms within two or three months. It is common to experience fatigue after a serious illness and most people find that they need plenty of rest during their recovery and that it is helpful to return gradually to everyday activities. Some people experience longer-term effects of encephalitis. Longer-term symptoms can include physical problems, memory problems, personality changes, speech problems, and epilepsy. Depending on your individual situation, you might benefit from physiotherapy to help with physical problems or speech and language therapy to help with speech problems. A clinical psychologist can help with memory problems and personality changes. Many people find that these services are an important part of their longer-term recovery and rehabilitation. Support and information on encephalitis.